A sustained campaign was needed to counter National Action in Fawkner. 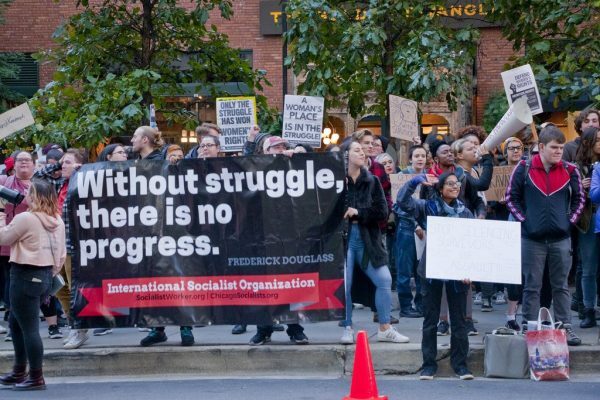 Photo from Freedom Socialist Party archives. I read this article and found it very interesting, thought it might be something for you. The article is called Lessons from the struggle: Massive community outreach was key to driving Nazis from Fawkner and is located at https://socialism.com/fso-article/lessons-from-the-struggle-massive-community-outreach-was-key-to-driving-nazis-from-fawkner/. 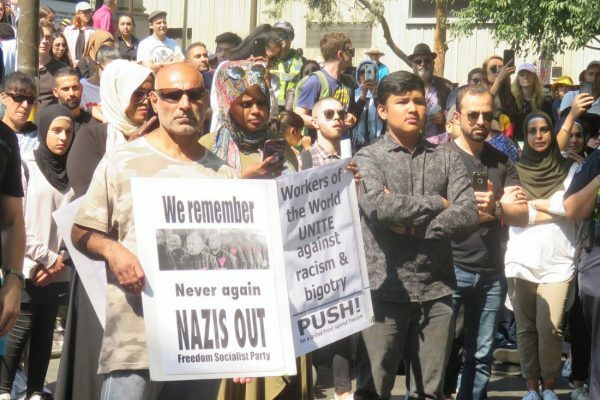 It’s a little more than two decades since anti-fascists celebrated the closure of National Action’s (NA) organising centre in Melbourne’s outer northern suburb of Fawkner. The Tyson Street “bookshop,” actually a bunker, closed in April 1998. A 15-month campaign exposed the fascists and ensured their project was a political flop. A clear and present danger. With the Eureka flag as their emblem, National Action presented themselves as Aussie nationalists standing up for the little guy. Under this surface was a militant white supremacist group formed by hardened fascists. Jim Saleam, who had joined the far right in his teens, founded NA in 1982. By the 1990s, he was jailed for attempting to murder Eddie Funde, African National Congress representative in Australia. Michael Brander, from Adelaide, became NA’s new führer. 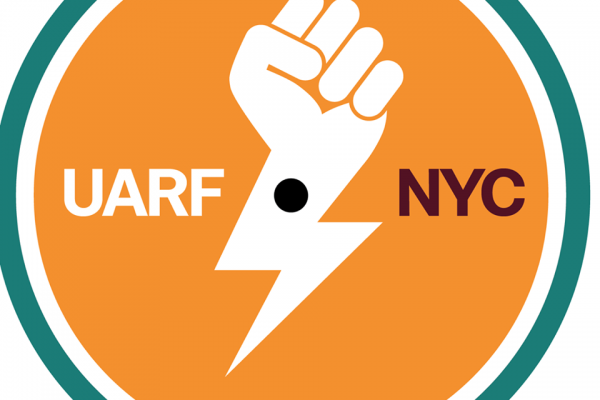 The group set about creating a climate of intimidation and fear by engaging in street violence and racist harassment, using anti-Asian graffiti, stickers and posters. Fascism is a method of governing, which capitalism will resort to if workers’ revolt looks possible. Its main purpose is to smash progressive working class organising, particularly unions, and eradicate all democratic rights. To do this, it needs a mass movement of street thugs. Groups like NA are the embryo of this. In 1993, NA thugs started popping up in Melbourne’s northern suburbs, harassing Asian school girls, Turkish women and tram drivers of colour. They vandalised buildings linked to anti-racist activities and carried out racially motivated attacks. Twice, the group attempted to rally in Brunswick. Thirty neo-Nazis were sent packing by a large, broad and militant community counter-rally, organised by Brunswick Against the Nazis. When Nazis start to organise, there are those who understand that disciplined self-defence is essential. But, without fail, there are also those who want to rely on “the authorities” to keep the community safe or who naïvely counsel that the Hitlerites will disappear if we just ignore them. ALP Mayor Glenyys Romanes called upon the media “to play it all down,” as though they’re simply publicity seeking clowns. Speaking to the Brunswick Sentinel (“Anti-Nazi rally voices its anger”), Peter Murray, who represented the Freedom Socialist Party in the Brunswick rally organising group, answered, “That’s all very well if you’re a white Anglo councillor, but it’s not very good for the Somali woman who, a few weeks back, had her arm broken by these thugs in Northcote.” The threat was real and had to be countered with a united front of all of fascism’s targets. Not in our community. Three years later, NA was back in the suburbs of Melbourne’s north with a new approach. Fawkner is a working class multicultural suburb. While the community is even more ethnically diverse today, in the ‘90s there was a large Italian and Arabic population. NA’s goal in opening a headquarters was to entrench itself in the community and use a mix of nationalism and anti-Asian racism to attract and recruit unemployed youth. Brunswick Against the Nazis re-formed as Campaign Against the Nazis (CAN). The first of five counter-rallies took place on 15 March 1997, two months after the centre opened. 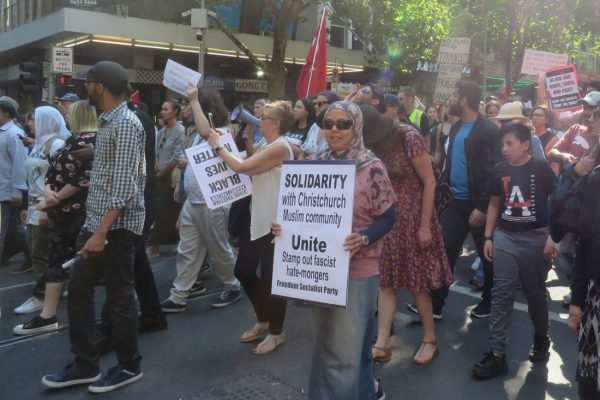 It mobilised more than a thousand disciplined anti-fascists, who marched through the heart of Fawkner to the centre, demanding that the Nazis leave. The rally was diverse and determined. Amongst the speakers were Ena Burstin from the Jewish Lesbian Group and an Australian Services Union official who lived in the suburb. The rally was an important show of support for the residents of Fawkner. 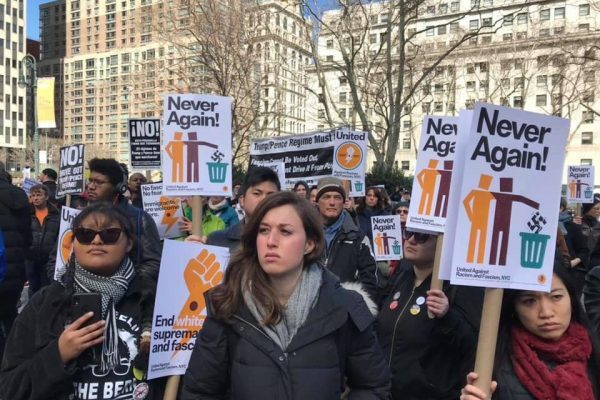 Despite its success, the first rally highlighted the necessity to build an ongoing anti-fascist campaign. Not only was the fascist headquarters well defended by its thugs, it was protected from the protesters by a massive show of police. The goons couldn’t easily be evicted, and a long-term campaign was needed. 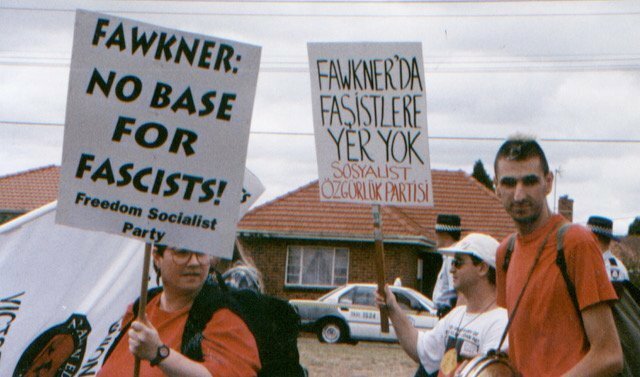 There were four more anti-fascist rallies in Fawkner, the final one a year after the first. A few weeks later, the moving vans arrived, the “Closed” sign went up, and National action left the state. It was a hard-fought battle, and it ended in victory. Between the rallies. Organising broad-based, disciplined counter-mobilisations to confront fascists and prevent them from building their movement is crucial. But there’s much more involved in cohering an anti-fascist movement capable of stopping them in their tracks. 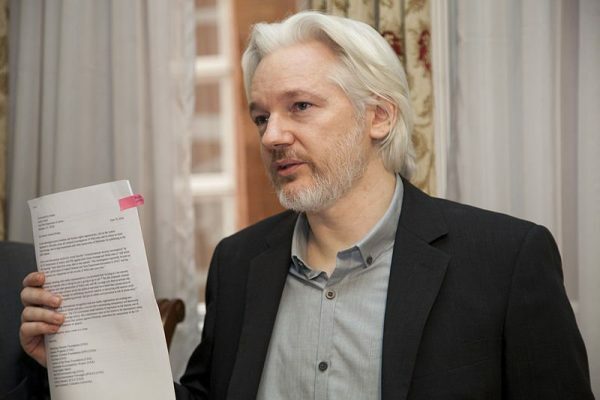 A key element of the campaign was educating and exposing NA and its agenda. 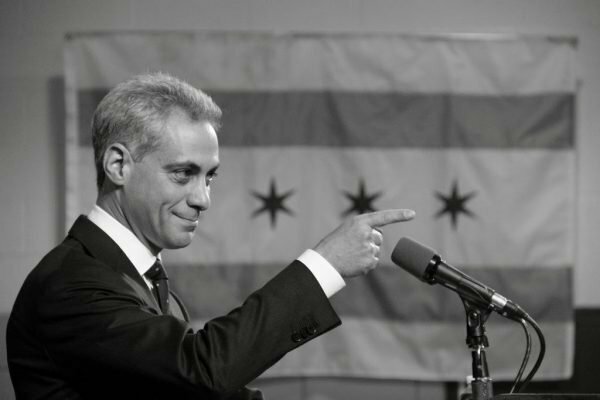 CAN held public meetings in the suburb. A crucial initiative was the production of a multi-lingual broadsheet alerting people to the dangers of NA and the importance of standing together against them. The entire suburb was letterboxed and doorknocked. A massive 20,000 broadsheets were distributed. Amongst Fawkner’s many older Italian residents were those with a history of resisting Mussolini and first-hand knowledge of what’s at stake. Aided by cops, Brander’s thugs could defend their base. But there was not a resident in the suburb who didn’t know that National Action was a dangerous neo-Nazi outfit. Faced with a massive educational campaign and a community against them, their shopfront became useless. The anti-fascist blitz prevented NA from attracting recruits — rendering its isolated suburban bunker a political failure. There are many lessons from the CAN experience for the movement today. It took 15 months to evict National Action from Fawkner, but they were booted out. Achieving this goal took tenacity! Alison Thorne has decades of experience organising against the far right. She represented the Freedom Socialist Party in Campaign Against the Nazis throughout 1997-98.